Ward off chills with a mini space heater that is perfectly sized for just-for-you warm-ups. The ceramic heater helps keep you comfortable in places like your desk, bedside, or just about anywhere when you’re feeling chilly. All heated up? A built-in fan can cool you back down and will automatically turn on if the heater gets too hot or tips over. The LED light will flash to give you a warning, too. Dimensions: 4.96" x 4.15" x 6.4"
This thing is small but powerful. My office is freezing all the time and I have been miserable. Not any more! This heater is perfect for under my desk. I don't wan to blast the whole room with heat so this is great. Love this little heater/fan for my desk. Perfect size and works great! So small and portable , fits almost anywhere for a perfectly targeted blast of 500 watts for that extra bit of comfort. Very well made and the emergency tip over switch is very smart, and necessary..
GeekHeat’s personal ceramic heater delivers on-the-spot warmth when you need it. 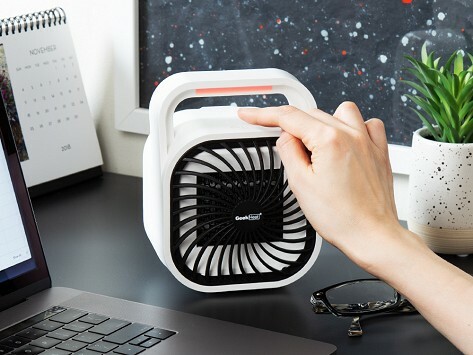 The portable mini space heater is the perfect desktop or bedside companion for the times when you feel a little chilly. The compact 500-watt design heats up quickly. All warmed up, and now want to cool back down? This heater works as a fan, too. There are safety features built-in if things get a little too hot, or if the heater tips over. An indicator light will flash and the fan will automatically switch on. GeekHeat is the toasty sibling of GeekAire, the portable rechargeable fan we found ourselves reaching for over and over. We think GeekHeat will be your new favorite warm-up sidekick.